The outgoing chairperson Josephine Feehily also says she’s looking forward to holding the Garda Commissioner to scrutiny in her new role. THE OUTGOING HEAD of the Revenue Commissioners has said that her office would definitely not be the right one to collect water charges. 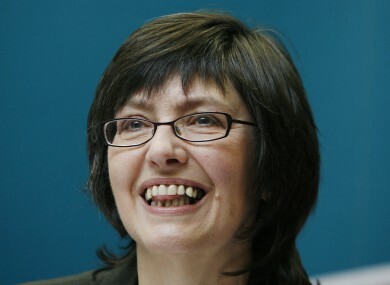 Josephine Feehily, whose last day in the office is on Christmas Eve, will head up the new independent Policing Authority in 2015. She told Seán O’Rourke this morning on his RTÉ Radio 1 show that it was never in question that Revenue would be put in charge of the water charges. No, no. Water is a utility. We collect tax. We understand how to design taxes. I don’t know about pipes or leaks and the Revenue has no competence in relation to utilities. It’s a different model. It’s little wonder that some quarters were looking to Revenue to ensure compliance with the water charges. Revenue has been quite efficient in collecting the Local Property Tax since responsibility for that was handed to them in late 2012. As Feehily noted today, the compliance rate for payment of the LPT for 2013 AND for 2014 has been 95%. The campaign for the next year of collection has already begun “and we are already up at 45% and 46% for this year”. Feehily made no bones today about her intention to bring the operations of the Garda Síochána into a more transparent age, in her new role as head of the Policing Authority. There will be eight members on the Authority, and Feehily will be the chair. She insisted that she wanted to see the Policing Authority passed into legislation as an independent body – much as Revenue became legislatively independent in her time there. She also spoke of her approval in the heads of bill (yet to be passed through Oireachtas) that the Garda Commissioner, now Nóirín O’Sullivan, be held to account in “quite a public fashion” every quarter. This is an amazing reform, for the first time since the foundation of the State… I’ll work it out. That’s one of the attractions of the post – it’s a start-up, it’s new, it’s a chance to put something in place. Feehily’s tenure at the helm of Revenue has not been without its controversies. She insisted that the Commissioners had investigated the Ansbacher accounts debacle fully – and that she still doesn’t know why she was never given access to the dossier of allegations of tax evasion by some politicians which was sent to the Oireachtas Public Accounts Committee. There was also a communication own-goal by Revenue in November 2011 when the office sent a letter to over 100,000 pensioners to advise them they would face extra tax should they be found to have under-reported the value of their pensions. We knew there was an issue and we had been asking the Department of Social Protection for some time to give us the data, we didn’t expect the extent of it. The government was struggling to create a budget – we had a responsibility to say to them there’s €45m that you can put into the Budget arithmetic from this project. In the event, we collected €65m on an annual basis from that project every year since and about another €35m in arrears so it was unpleasant and again I was sorry for the way we handled it but our job was to collect the tax. And most of the people were earning €40,000 and €50,000 pensions on top of the State pensions. The Revenue Commissioners and the Department of Social Protection now share data between them on a weekly basis, Feehily said. Email “Revenue has 'no competence' to collect water charges - and that's from Revenue boss”. Feedback on “Revenue has 'no competence' to collect water charges - and that's from Revenue boss”.